Let us focus on satisfying and retaining your existing customers, while you focus on getting new ones. We work with you to maintain your brand and to provide your customers with a personalized, consistent experience. We’ll build a top-notch customer service team and train them to represent your company. We offer scalable outsourced customer service, technical support and customer relationship management. 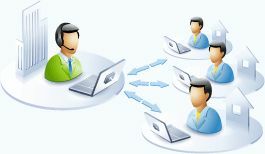 Whether through telephone, email, live chat or social media, we can establish a customer service center dedicated to communicating with your customers and promoting your brand. We provide complete B2B and B2C support. We’ll customize a customer service outreach program just for you. We specialize in out-bound surveys of all kinds and fundraising mailings. Outbound surveys come in many different varieties and can vary greatly in size and scope. From surveying incoming school students for enrollment data, to polling property owners about proposed legislation, we can create the forms, online or in paper format, compile the contact and email and/or mail the survey. We’ll also track and measure the results, based upon your goals and metrics. We customize the approach for each and every survey we do to ensure proper feedback. Whatever information you need to gather, we can do it for you and compile the data you need — customer feedback, product surveys, political surveys, employee surveys and more. Fundraising mailings are a great way to raise money for your cause. We’ll create and print your fundraising materials and mail them to your list of names. We’ll even set up a PO Box to accept your donations and track the results. Fundraising mailings are common for non-profit organizations, and schools. Let us help your organization. Managing supply chains efficiently, quickly introducing products and maintaining inventory accuracy are essential to meeting customer service expectations. We can eliminate your paper-based record keeping processes that stifle productivity and profitability. Features like enterprise search and electronic distribution build efficient business practices. Outsource your customer service requirements with Paper Alternative and leave management headaches behind while we improve your customer experience.